Parallel printing in SAP can be achieved by adding printers to device pool on SPAD. 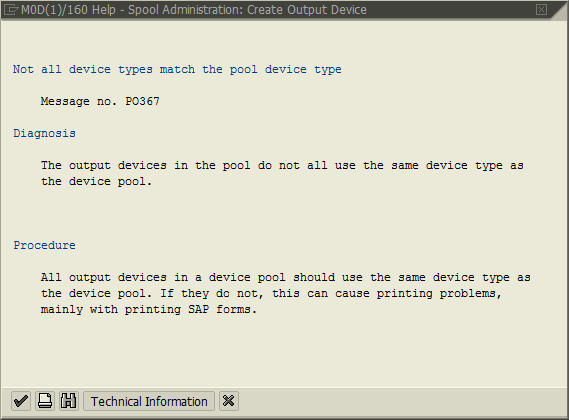 SAP users can print outputs at the same time simultaneously using device pool settings in SPAD Device Administration. SAP users and ABAP developers can check their SAP systems if there is already defined any device pool or not by using SE11 and filter data with PAARCHIVER field with value P (Device Pool) on ABAP transparent table TSP03D - Spool: Device Description (New Format). If there are sample device pools then ABAP developer can use these devices for parallel printing of SAP outputs or can use as a template for creating a new device pool that will support printing on multiple printers at the same time. In order to create output device of device pool on SAP system, execute SPAD Spool Administration transaction. 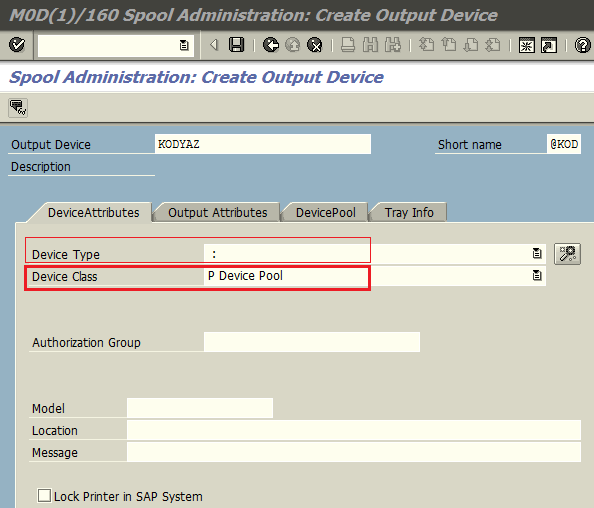 As seen in below screenshot from SPAD SAP screen, select the Device Class as Device Pool (P) on the default tab Device Attributes. Of course other device attributes like output device name, short name, device type, etc should be provided as well. As noted before, one restriction is the choosen device type must match with other devices that are part of the device pool. Next step for creating a multiple printing device from different printers on SAP SPAD screen is defining those parallel printing devices. For this definition, switch to DevicePool tab where the list of devices are displayed. Since this is a new device pool, the pool device list is empty. Add your target printers (devices) to the device pool on this screen. Another important configuration on this screen is the transfer function. Change Transfer Function from the default "Send to a Device in Pool" option to "Send to All Devices in Pool" option for multiple printing at the same time on different printers named as parallel printing devices. 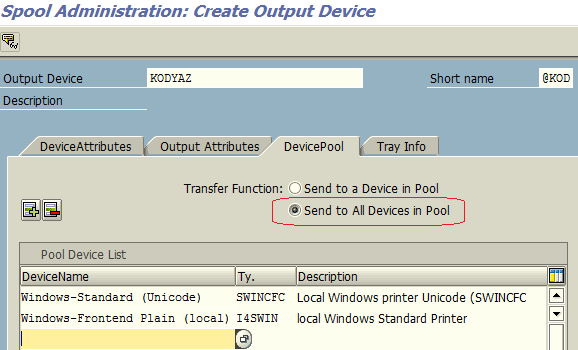 If the devices added to the Device Pool have different device types, following ABAP error message will be displayed on the Spool Administration SPAD transaction screen. The output devices in the pool do not all use the same device type as the device pool. All output devices in a device pool should use the same device type as the device pool. If they do not, this can cause printing problems, mainly with printing SAP forms. After all configurations are correctly set, if you set the new device as the logical destination of an output on SAP like a sales order confirmation or billing output like invoice, you will see that there will be a single row created in ABAP NAST table for the device pool name on LDEST (Spool: Output device) field. The spool requests created for parallel printing of SAP outputs at the same time can also be tracked using the ABAP tcode SP01, Output Controller Spool Request Selection Screen.